For those who have been following my blog, Future posts will happen at http://theodorerichards.com/blog. The work of The Chicago Wisdom Project has grown over the last several years and is ready to expand into its next phase. We have recently acquired sixteen acres of land in Michigan to be converted into a permaculture farm. We are seeking to train artists, teachers, activists, anyone with a stake in how we educate our youth–and this includes everyone–to implement this radical approach to education. As a recent news story in which we were featured suggested, The Chicago Wisdom Project provides an alternative to the unimaginative solutions from our politicians. But it also allows us to learn from our youth by empowering them to tell their stories as they become creators, not merely consumers, of culture. This is a reminder that there is still time to sign up for The Chicago Wisdom Project’s “Wisdom Teacher Training” program. The class will be conducted through teleconference each Thursday in May.There are partial scholarships available. Feel free to call or email us for more information (646-285-8263/ info@chicagowisdomproject.org). Yesterday, the Chicago Public Schools announced the closure of around fifty schools. I am not an expert on how to run a school district. I am certain there are difficult financial decisions to be made. So I won’t oversimplify the conversation. I won’t suggest that the decisions that were made about these schools was easy, nor will I say that any decision to close a neighborhood school is wrong. But there are some points that need to be made about these decisions. First, the “declining enrollment” problem that the school board has consistently used to justify the closures must be seen in context. While there are genuine demographic shifts in the city of Chicago, CPS has also systematically undermined neighborhood schools, ignoring them while investing in selective-enrollment schools. Even more insidiously, they’ve allowed for the privatization of public schools through charter schools. Just as parents would have favored a mediocre Catholic school twenty years ago, many have justifiably chosen a mediocre charter over a terrible public school today. Leaving alone for a moment the issue of unions, my problem with charter schools is that they are simply, by and large, not very good. Even by the standards favored by so-called “reformers” like Michelle Rhee who champion them, charters don’t generally improve outcomes. At this very moment, charter schools are getting ready to fill the void left by these closed schools. Why are most charters not particularly good? It’s because they, like their advocates, lack a sound educational philosophy. Even if one buys into the idea that closing a bad school is a good idea, the real question is “what school will our kids attend now?” The answer, it seems, is usually one that is not much better: another bad neighborhood school; a charter school that is only concerned with test scores; or, if you are lucky, you literally win a “lottery” and the right drive your child for hours each day to a supposedly good school. In no other area I can think of is the metaphor of rearranging deckchairs on the titanic so apt. Hours of homework for children as young as kindergarten, even though we know this has no benefit. Little time for creativity in favor of “basic skills”, even though we know that creative and critical minds are the most successful in the long run. Little exercise or outside time, even though we are in the midst of an obesity epidemic and evidence shows that physical activity is good for academic success. Little free play, even though we know that free play is the central element to child development. So we’ve closed a bunch of schools that were, admittedly, poor. But are those kids really going to better schools now? And what makes a better school? Still waiting for an answer on that question, and I suspect we will continue to wait, long after those schools are turned to rubble or re-opened as corporatized charters. *To join a real conversation about education, attend The Chicago Wisdom Project’s event Saturday, March 23. *For more on the ideas that constitute an authentic re-imagining of education, read Creatively Maladjusted: The Wisdom Education Movement Manifesto. 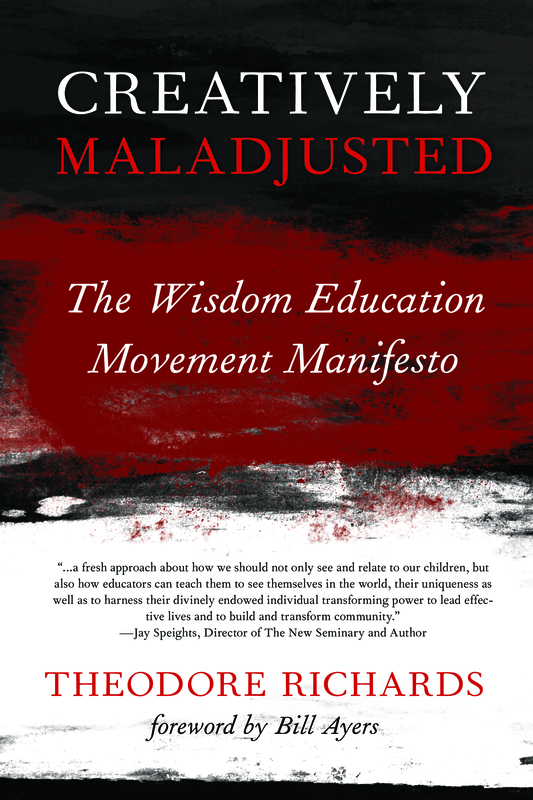 I am pleased to announce that Creatively Maladjusted: The Wisdom Education Movement Manifesto is now available for purchase. Click here to buy. Many of the ideas in Creatively Maladjusted come from The Chicago Wisdom Project, a program for marginalized youth that implements this radical vision for education. Please join us for our fundraiser and book launch on March 23rd. The Chicago Wisdom Project is part of a growing movement with partners throughout Chicago and the United States. For more on our Wisdom Teacher Training Program, click here. Richards’ book is a very good read—not dull and not overly mental as so many educational studies tend to be. With stories and humor, as well as anger and a passion to make things better, Richards makes a strong case for putting learning ahead of testing and emphasizing values more than competitive scores. He recognizes that young people desire to learn but their alienation is such that “things must change quickly and peacefully or they will certainly change rapidly and violently.” He warns that “if we want the next generation to reimagine our world, we must educate them differently.” He sees real educational improvements occurring more through movements than through institutions. A movement is open to all interested parties from parents to teachers, from counselors to philanthropists. Teachers in public schools are “overworked, under pressure, and generally in a bad mood,” he observes. And many just quit. Education is not a real happy place these days. Richards wants to shape education by story rather than by information, by resisting consumerism rather than educating for it. The goal of education, he reminds us, “is not to make better schools, but to make a better world.” And “the ultimate relevance of a school is what kind of civilization it inspires our children to create.” Modern industrial culture has pretty much defined education in its terms; we can do much better today and must. The metaphors, narratives and values of our educational system are outmoded. A Wisdom Education Movement can bring alive new values that assure a “nurturing, creative, joyous, inspiring place.” This book is well worth reading; and discussing; and arguing; and enacting. that you taught me to love. The modern project has been many different things, but perhaps foremost it has been a movement to forget our ecological identity. The psychological reasons for this are understandable. The wild is scary and dangerous. Our ancestors can be forgiven for believing their purpose was to tame it. But now that we have largely—by appearances—tamed nature, it is unforgivable that we continue to pave it… Even more unforgivable is that we continue to pave and to repress the nature in our selves. but what of our at-risk-civilization, -species, and -planet? The Following article was originally published in the Summer 2011 edition of Written River and includes excerpts from my forthcoming book, Creatively Maladjusted: The Wisdom Education Movement Manifesto. The best school I ever went to was behind my garage. There was no actual school behind my garage, of course, but I did learn a great deal there. I grew up in the city of Rochester, NY, in a neighborhood with ample space for a child to roam and play and in a time—the seventies and eighties—in which parents had not yet become too scared to let children roam and play. The first roaming I did was between my friend’s house, directly behind mine, and the space behind our garage. It was certainly not a rural area, but there were trees and bushes, cats and toads. Like many little boys, I decided to build a fort. I spent hours behind that garage, hammering away at scraps of wood, building nothing much substantial, but able to let my imagination take flight and to get my hands in the dirt. I would suggest that this phrase—“letting our imagination take flight and getting our hands in the dirt”—could be the foundational principle for the future of education. I soon was able to venture beyond the backyard area on my own as I got older—not much older; children today would be shocked, and probably envious, at how much freedom I had at a young age. I spent my summer days riding bikes and skateboards, playing basketball and football, talking and fighting. Although I occasionally had a camp or activity to go to, I usually had no plan. I did not even have to call a friend. Just going to the local public school was usually enough to find a game to play. As I entered adolescence, I began to wander beyond the neighborhood. I took the bus downtown with my friends, rode my skateboard to different neighborhoods, played basketball at the park. I saw a world beyond my neighborhood, and people who did not fit into its narrow socio-economic and ethnic limits. Of course, I wasted time playing video games and watching TV, and occasionally got into trouble—like most kids, I was not particularly aware of my own mortality—but I also continued to explore my world. I got my hands dirty and let my imagination fly. East High School was a sprawling complex made up of various wings, taking up a complete city block. One small wing was referred to, quite indelicately, as “the box”. I cannot say whether this was a name given to it by the students or the official one. I hope it was given by the students. For “the box” was the area of the school where special education students went. Unlike the other students in the school, they were not allowed to roam from wing to wing while changing classes. Tellingly, this is the term prisoners use to refer to solitary confinement. Much later, it occurred to me that all schools are “boxes”, based on the principle that containment of our youth is one of their primary purposes. Day after day, year after year, our children are put in boxes. University of Maryland professor Jane Clark calls them “containerized kids.” There are days, particularly in northern climes when the days grow short, when our children see no sunlight except through windows. The test scores are too low, goes the argument, so we must keep our children in school longer. Among the great tragedies of modern life is the alienation of the human from the natural processes of which we are a part. Our alienation from nature and the Earth is not merely an educational issue; it is a problem for our species. We are destroying the planet, in part, because we have managed to delude ourselves into thinking we are separate from it. For any educational program to truly be subversive, it must challenge the dominant paradigm in the industrial world that has estranged us from the Earth. In truth, nature is not merely a nice place to go on the weekend. We are nature. Our very existence cannot be separated from it. We could not eat, could not breath, could not survive at all without the community of life around us. To know our selves, then, is to understand the ecosystem in which we are embedded. As an urban child, I appreciated the culture, the diversity, the intensity of the city, but did not understand what I could learn from nature. It was not until I was in my mid-twenties, when I went left Chicago for a training program for my work in Africa, that I realized what I had missed. Before leaving for Zimbabwe, I had to attend a training program in the Berkshires, the mountains of western Massachusetts. I spent four months there, watching summer turn to autumn and then winter. I spent hours alone in the woods, simply walking and listening. Although I could not yet articulate it, I learned that being silent in the woods meant listening to the cosmos. Being silent in the woods allowed for a whole Universe to enter my soul. I connected to the rhythm of the seasons and the days in a way I never had before. I did not learn facts, but shifted my consciousness in myriad ways. This transformation only intensified while I lived on the dairy farm in the eastern highlands of Zimbabwe. Each night I watched the skies come alive as the sunset faded into the starry sky. I watched the milky way spread out across the sky, watched the zodiac rotate, watched Orion do cartwheels. I learned to eat what could be grown and what was in season. I learned to be thankful for the rains when they came. As the years unfolded thereafter, I sought out opportunities to commune with nature at every opportunity. I felt this need not out of any scientific, intellectual understanding for the benefits of and our relationship to nature; I understood because I had experienced a relationship—a relationship that taught me who I was. In response to our failing education systems, built on the model of the unholy trinity of the factory, the prison, and the mall, our leaders seem only to be able to propose more of the same: more restriction, more punishment, more consumerism. The problem with our schools, at its core, is that we use the wrong metaphors to understand education. The metaphor of the human as machine has reduced learning to quantifiable outcomes; industrial capitalism has become the primary context for education. To reclaim education—indeed, this is nothing new—requires a return to Wisdom Education. While this involves many dimensions, I will focus here on nature. That is, instead of thinking of the human as a machine, we must use organic metaphors. More is at stake here than our schools—without instilling in our children a reverence for and embeddedness in ecology, we have little hope of saving our species. There are also reasons that have only to do with education—that is, not with addressing the ecological crisis—for including nature in the learning process. A variety of problems arise, as wide ranging as the intellectual and creative development of our children and their emotional and physical well-being, from a lack of time spent outside, in nature. We are better able to concentrate when we spend time in nature. Our children today are seemingly always plugged in or in front of a screen. They become accustomed to being entertained constantly with quickly-changing images—images that are designed to entice them to buy something, usually. As a result, it has become increasingly difficult to get a child to apply the kind of concentration that profound learning requires. The answer of many educators has been to give the kids more of the same, to integrate new technologies into the learning process. While some of this is appropriate—indeed, we have done it in our programs at the Chicago Wisdom Project—it is not the only answer. Learning is an organic process. Screens cannot replace people; computers cannot replace nature. When in nature, we use all our senses, whereas the television screen requires only sight and sound. A forest, for example, can be a context for the imagination to take flight. The role of nature cannot be separated from that of creativity and imagination. To be intimate with nature is to be filled with awe, to be inspired by the creativity of the natural world. Educators seem even less aware of the need for students to get outside than they are of the importance of art in the classroom. Students who spend time in nature and are physically active will find it easier to concentrate and will have the emotional balance that learning requires. In spite of this, myriad school districts are cutting recess in favor of more time to prepare for tests. Recently, when several districts were forced to cut the school week back to four days due to budget problems, it was found that test scores actually went up. So much for the value of preparing for the test. In fact, several schools have shown to increase test scores through an environmentally based curriculum. While it can be a challenge to interest students in nature when they have spent most of their lives surrounded by concrete or being driven around from mall to mall, everyone likes food. Once an essential part of the learning process, seldom do schools integrate food into the curriculum. Traditionally, one learned in order to know what foods were safe to eat in the wild and how to procure them, to understand the rhythm of the seasons and how to grow food, and to prepare good foods. Food is not merely something that keeps us alive; it is also an expression of our culture and how we are connected to place. There is, then, a politics of food that, like any politics, involves our freedom. We still (sometimes) remember that we cannot be free if our minds and voices are controlled by someone else. But we have neglected to understand that we cannot be free if our food and its sources are controlled by someone else… One reason to eat responsibly is to live free. How many immigrants have come to this country in recent years due to U.S. farming policy? Why? How does this policy affect what we eat? All these are important questions to address if we are to understand the pressing issues of the day. The best way to learn about food is to grow it our selves. Urban farms and community gardens have become increasingly widespread in recent years. Children will be thrilled when they can eat something they have grown themselves. Creating a garden or farm teaches organizational skills. Most importantly, students begin a transformation of sense and sensibility. They begin to recognize the rhythm of the seasons and appreciate the living community around them. Moreover, they spend time outside, away from the boxes of classroom and television. They can get their hands dirty and let their imagination take flight, just as I used to behind my garage. We can no longer afford an academic calendar designed when America was a nation of farmers who needed their children at home plowing the land at the end of each day. That calendar may have once made sense, but today, it puts us at a competitive disadvantage. Our children spend over a month less in school than children in South Korea. That is no way to prepare them for a 21st-century economy. In addition to the lack of evidence that a longer school year will improve schools at all—apparently he had not heard about the rising test scores with four day weeks—the president’s reasoning is flawed for a far more important reason: our estrangement from the agricultural process should not be viewed as an inevitable sign of irreversible progress, but as a crisis. While I understand his desire, and the desire of educators from whom the president takes his cues on this issue, to deal with the problem that our children spend their summers and after-school time watching television, our task as educators must be to find better ways for our children to spend their free time, not eradicate the notion of free time altogether. Maybe we should consider that our young people should be plowing the land, not locked away in a classroom. The values expressed in this quote are telling. The purpose of education, according to the president, is to prepare our youth for “the 21st century economy.” The typical values of utilitarianism and capitalism—the assumption that education is “competitive”—rise to the fore. The irony is that I am fairly certain that the president was not educated in this way. If one were to ask him how he became the man he is today—and while I am criticizing him on this matter, I think he has many admirable qualities—he would surely not point to being prepared for the 21st century economy. And I doubt he educates his own children with this in mind. This is one among many examples of how, although clearly more committed to education than the Republicans, the philosophy of the two parties remains fundamentally the same. While Democrats are quite right to criticize George W. Bush for the No Child Left Behind debacle, it should be remembered that they usually do so only because of the Republicans failure to fund the bill—not because of its focus on testing, with which they basically agree, or at least can offer no alternative. The lessons of farming truly come alive for the youth when they begin to harvest, prepare, and eat what they have grown. Cooking is a hands-on way for students to learn myriad lessons, seeing their profound connection to the living world through their food. It is hardly controversial to suggest that there is an epidemic health crisis among our children due to their diets. The rate of type 2 diabetes in children, once only found in adults, is soaring, particularly among Black and Hispanic children. Obesity has never been greater. Our leaders take away free-time and eliminate recess, limit the time a parent can be home with children to prepare food, and wonder why these problems are on the rise. Criticizing the victims—blaming obese children for lacking discipline—is the common response. By growing, cooking, and eating their food, the youth can see an alternative to fast food and chips. They can learn the skills, knowledge, and creativity required to garden and cook. Moreover, they can begin to recognize the relationship between the obesity of the American child and the malnourishment of children in the Global South by exploring the industrial food system that is so different from the simple and beautiful process of growing and preparing one’s own vegetables and fruits. If one’s garden is big enough, the youth can learn to can and store, as well as sell, their produce. While I have criticized the values of global industrial capitalism, I see nothing wrong with starting a small business with young people. In fact, it can teach many lessons, both practical and academic. The culmination of these lessons on food, of course, is eating. This will surely not be lost on any group of kids. We do not share food as much as we used to. This impoverishes us spiritually and diminishes our sense of community. To share food is essential to our humanity. Any teacher, in any type of classroom, will find his job much easier if students are preparing and sharing food together. While most schools, I suspect, will say that this is too costly and takes too much time that could be spent on learning basic skills for tests, a deeper analysis suggests otherwise. How much money is wasted on drugs for children who cannot concentrate because they have too much sugar in their diets? There have been documented cases of children dramatically changing their behavior as their diets have changed. Moreover, sharing meals brings about a spirit of community in a classroom or youth group. We learn in community, from one another, and food can be a catalyst for this process. We are nature. Any discussion about nature is extraordinarily difficult because of the tendency to reinforce the dualism of the human and nature. Nature is not place to visit; it is that from which we arise. The human body is nature. We have evolved not only from the Earth, but also within the Earth. The point is that, when we truly understand how we have evolved, the lines between the human and nature become blurred. Our identity, so fundamental to the basic purpose of education, cannot be isolated in the mind, walled in behind our skulls. In any science curriculum, evolution is a core concept, the core concept around which the study of biology is organized. This is significant not merely because it is an interesting theory about science; its significance lies in what it tells us about ourselves. Evolution tells us who we are. We cannot teach our youth a particular narrative in science without having the courage—and I say courage because there will be fundamentalists who understand neither the Bible nor evolution who will make this politically difficult—the courage to integrate it into the students’ pursuit of understanding themselves and their world. It does not mean telling them what evolution should make them believe. Rather, it means showing them the evidence for evolution and challenging them to develop a narrative that is both personally meaningful and intellectually rigorous. Wisdom Education has always been about answering fundamental questions such as “Who am I?” Until the modern period, much of this understanding came from a myth, a narrative or story that described how we came into being. The creation myth made sense of our world and our place in it while showing how we were at once connected and unique. In a traditional or indigenous society, there were no academic “subjects”—everything was understood through the lens of the myth. And even when subjects did arise—in a medieval school, for example—they were still understood through a common lens. We can now criticize the lens—I am not advocating basing a curriculum on Scholastic theology—but we have to find a new lens to replace it. What, then, is the lens through which we can organize a new Wisdom curriculum? One possibility is by looking at the world in terms of ancestry, which is essentially what the creation myth of an indigenous society does. The difference, however, is that ours is a pluralistic society that derives much of its knowledge about the world through science. Modern, industrial society is marked by an abundance of information, uncovered by science and made available through technology. The problem is that the diversity of our society and the overwhelming amount of information make it difficult to find a coherent narrative around which to organize a curriculum. I would suggest that nature itself as understood by modern science can provide the foundation of just such a narrative, a narrative that can be both pluralistic and unifying. I am not suggesting that we introduce any more information into a school curriculum than what is pretty much already there, but that we can begin to recognize that, through our ancestors, we are intimately connected with every one and every thing. Ancestry is not just about the past, but who we are. Our DNA is a legacy of the past, present in each of us. The way we structure a curriculum, although we are seldom aware of it, upholds a particular worldview. The worldview conveyed through the curricula of a modern school, no matter how progressive, is one of fragmentation. Each subject is disconnected from the others. The mind is disconnected from the body. Art is marginalized. A curriculum conveys meaning not merely through facts. I would not propose many new facts to be introduced to our schools. In fact, we probably have too much information. The importance in a curriculum is in how it organizes information. The story of the universe would be a narrative that would allow us to organize information fluidly, interconnectedly, organically. Teachers, however, generally operate according to the metaphor of a student as a machine. We speak of inputs and outputs, of quantifiable results. We test our children like they are automobiles. But our children are not automobiles, or even computers. They are as complex and chaotic as a stream. A stream can be studied and understood to an extent through quantifiable information, but not with the straightforward simplicity of a car. The story of the universe is not about a world that was created from the outside and that cannot be changed from within. This is the story of a universe that has changed throughout its history, and the universe itself has participated in the change. While this does not mean that we live in the mechanical, atheistic world of some Modern thinkers, it does mean that we participate in the change that happens. While we cannot control our future, it is also not dictated to us. What lesson does this convey to our youth? The first humans had the courage to walk out onto the African plains. They evolved as they did because their survival depended on their spirit of exploration, their inventiveness, their intelligence, and their capacity for cooperation. They developed the ability to use symbolic language and to make meaning through symbols. Some of the earliest examples we know about are the Paleolithic cave paintings. In 1995, I was lucky enough to view the paintings at Altamira, in northern Spain, of which Picasso was said to have been moved to near-speechlessness, uttering only that, in the thousands of years since, we have done nothing more beautiful. Many of the images represent the predator-prey relationship. These early people seemed to grasp intuitively that we are not in competition with nature, but that we evolve together. Had our predators not been so formidable or our prey not been so elusive, we would not have evolved the above capacities to such a degree. We owe our very existence to nature. The other predominant image in the cave paintings is much simpler, but perhaps even more profound—the handprint. Inside the cave, these people imagined they were inside the womb and made an image that reminded them of the baby’s handprints they had seen on the mother’s belly. They understood, in their wisdom, that we are like the baby in the womb, pressing out at the edge of our world, exploring it, testing it. This is an important part of who we are as human beings. Not as disembodied minds, but as a part of a natural process that connects us to the living world. So, as the narrative of the universe story connects us to nature, it connects us to our role as creators, as world-builders, as mythmakers. The role of nature and of creativity cannot be separated. The highlight of a recent nature retreat in Michigan was surely a midnight walk I took with a group of girls. About ten minutes from the cabin was a small lake. While many of the girls were terrified at the sheer darkness of the woods at night—this group was from Chicago—they came alive when we reached the dock. “It is so beautiful!” several of them exclaimed. I have been moved to tears by the sight of the nighttime sky, so this was something particularly gratifying to me. They were enthralled and inspired, listening intently as I explained that the light from the stars they saw had left many years ago. I am certain that they will remember it better than had they been taught it from a textbook. It is impossible to exaggerate the importance of such an experience. This moment is the key moment in one’s education. It is the moment when we are alive, when we realize that we live in a beautiful, awesome, enchanted world. We realize that, beyond what anyone else can try to force us to do, we are inspired to learn. The work of education, of course, is not to make better schools, but to make a better world. Too often, I believe, educators forget this obvious and simple truth. Discussions about education seldom reflect the kind of world we might imagine is possible; rather, they focus on achievement and success within a given paradigm. They seem not to realize that the way we educate our children creates, reinforces, or shatters the paradigm. For example, when we assume that the purpose of education is to help students find a job in the global economy, we forget that the “global economy” is not some force of nature. Humans created it. It exists because of the decisions we made, decisions based upon how we view the world, which is based on the way we have been educated. While what goes on in a school is important in itself—after all, our children spend most of their childhoods there—the ultimate relevance of a school is what kind of civilization it inspires our children to create. A school is not “good” if its students get good test scores but are so unhappy, so disconnected, and so unable to think critically that they go out in the world and commit acts of violence and destruction. Such schools only give more power to the mis-educated. I think I prefer the “bad” schools. Modern industrial culture is ill equipped to deal with the crises of this moment. For the first time in human history, we face a mass-extinction that threatens the viability of life on the planet. This crisis was largely created by modern industrial culture. Its values can only lead to more destruction. On the one hand, we have the current model in which the world is the marketplace for global capitalism, the school a factory, and the child a machine; on the other hand… this is a hand is empty, a story we have not yet told. In part, it is our responsibility to offer our children a new vision. But we also must empower our children to become mythmakers, to tell the story of the their generation themselves. The metaphors and narratives and values of our educational system are problematic. This can be argued strictly on an educational level. That is, we can show how the current educational system simply does not work. Our children are becoming less, not more, educated through it. I would like to leave that argument behind now, and address what I think is at the core of the need for a Wisdom Education Movement. That is, even if the modern educational system did work within its own artificial and self-serving parameters—it is telling, I think, that educators have so much trouble showing this considering how easy it generally is to invent criteria that validates a given system—it will fail in the consequences it has for the planet and for our species. This is at the heart of our reason for educating children in the first place. Seldom, if ever, do educators discuss it. They may argue that this is because it cannot be proven quantifiably. If they do, they will have proven my point. So what are the consequences of our current educational system? First, our school system, in using mechanistic metaphors, raises children to relate to the world as a machine. The consequences of this are clear and devastating. We can talk about “greening” our schools and tell our youth to recycle all we want, but if we continue to instill in them the notion that the world is a machine, they will unthinkingly relate to it as a resource to be used and manipulated. They will not value it. The consequences of not valuing the Earth, of not holding it sacred, are expressed largely through the system of global, industrial capitalism. The criticism here is not with the notion of “free-enterprise”, but with the notion that the economy is primary, ecology secondary. Economics dominates nearly every aspect of the public discourse, including education. In fact, economics, in its proper place, refers to the way we use and exchange resources. It is a subset of ecology. To be a human being, to survive, requires first to be embedded in a web of life. Without our primary relationship being to ecology, we behave as though we are disconnected from the Earth. When we consider the economy to be primary, we make choices—not simply individual ones, but civilizational choices—that express this devaluing of the Earth. A myth is most fundamentally about how we understand our place in the world. In the myth of modernity, we believe it is our place to manage, subdue, and control the Earth through the mechanisms of global, industrial capitalism. The only answers we can come up within this paradigm continue to reinforce this skewed relation. We believe that capitalism and technology, for example, are the solution to the ecological crisis. While technology can and should be part of the solution, we cannot solve our problems through the same mentality that created them. Technological and capitalistic solutions are popular with politicians for one simple reason: these solutions do not require a change in mentality or lifestyle on the part of wealthy, Western nations. The reality of the situation is quite different. As resources are depleted, as pollution and global warming intensify, and as species become extinct, we are faced with a choice if we are to survive: either wealthy nations dramatically reduce consumption or we force—and increasingly, this force with truly be enforced by force—the world’s poor to continue to live in squalor. We cannot sustain our current consumption patterns, particularly if the world’s poor demand an increasingly large piece of the pie. What’s at stake, therefore, is our survival. The myths of modernity, reinforced in our educational systems, perpetuate a worldview that not only encourages us to act as we do; it does not allow us to act any other way. Personal discipline or lack of information is not the problem. The problem is that we have been trained by our schools to see the world in a particular way. And this is leading to our demise. Metaphors, if they are powerful enough, have a way of becoming real no matter how absurd they are. The role of nature in Wisdom Education is something we should not even have to think about. But unfortunately, we must. For nature is perhaps more marginalized from school curricula than any other element of Wisdom Education. The ultimate aim should be to create an atmosphere in which children do not think about nature because it has become their basic context. Even in science classes, our children rarely get their hands dirty, rarely get out of “the box” to truly explore their world. If the conveyance of information were the purpose of education, this would not matter. But education—Wisdom Education—is about shaping consciousness and about how we relate to and act in our world. To remove, at least partially, the barriers between the human world and the natural world, is to begin the process of shifting this relationship. And why should we want to shift it? We should want to shift this damaged relationship because our survival as a species depends on it, for starters. The absence of nature in modern education is directly related to the ecological crisis. The modern project has been many different things, but perhaps foremost it has been a movement to forget our ecological identity. The psychological reasons for this are understandable. The wild is scary and dangerous. Our ancestors can be forgiven for believing their purpose was to tame it. But now that we have largely—by appearances—tamed nature, it is unforgiveable that we continue to pave it. Even more unforgiveable is that we continue to pave and to repress the nature in our selves. The need to bring nature into the learning process is not only practical. After all, our survival as a species is not guaranteed either way, even if it is more likely if we remember that we are a part of the Earth. The certainty is that if we can help the youth to reconnect to nature, we can promise them richer, more meaningful lives, and that they will grow up to be better educated human beings. Louv, Last Child in the Woods, p. 207-208. To understand more about The Chicago Wisdom Project and the work to radically re-imagine education, please read the from the forthcoming book Creatively Maladjusted: The Wisdom Education Movement Manifesto below on one of the fundamental questions asked in what we call “Wisdom Education”: Who Am I? Below that, you will also find a short film created by a group of Chicago Wisdom Project students called I Am. Finally, I have included my own poem entitled “I Am” (from my collection Handprints on the Womb). In some ways, this is the central question of Wisdom Education. One could argue that it is the central question of our lives as human beings. For all the time we spend worried about finances and careers, about what to buy and what to wear, our ultimate happiness lies in having a sense of who we are—that is, finding purpose and meaning and a sense of our place in the world. The problems of Modernity are mirrored in Modern education. We cannot blame educators for reflecting, to some degree, their society. Foremost among these problems is the loss of a sense of identity that binds us to one another and to our world. In letting go of the restrictions of traditional society that “kept us in our place”, we have also lost a sense of belonging. I am not arguing for a return to a more restrictive, traditional culture—this is what the fundamentalist argues—but to remember that making our lives meaningful is important work. In exalting the individual, modern industrial society gives us remarkable individual freedoms. The problem is that we are so individualistic, at times, that we forget that we owe our existence to a web of relationships. The point is not to eradicate the individual, as some fundamentalists, New Age cults, and totalitarian regimes advocate, but to situate the individual in a meaningful story. These groups fixate on texts; I am emphasizing context. I want all of my students to find some measure of personal success. I want them to find financial stability and the prestige that comes from a good job and degrees. But this cannot be the basis for an educational system, for these achievements are competitive. They reflect a society with winners and losers. The “Race to the Top” cannot be anything but a reflection of this ethic. In all the talk about test scores, it is seldom mentioned that tests are graded in terms of a percentile—this means our success, as in every other realm, is based upon how we compete with each other. I have not yet heard it explained how we will have every child in America scoring in the 99th percentile. Perhaps this, as much as any test, shows how bad Americans have become at mathematics. So what of the child who does not go to Harvard? What do we want from a person, in this culture, of whom it can be said, “He is educated”? It is my hope that the answers to this question emerge, in part, from our work as a whole. That is, a person who is educated is creative, has a relationship with nature and the body, tries to be healthy of mind and of spirit, is intellectually astute and thinks critically, and does something meaningful and useful with all these capacities. The answer cannot come from a single person or a single book. It must emerge as part of a holistic process. Many of the answers will emerge from the youth themselves. At the core of any answer one might come up with, however, is the answer to this simple question: “Who am I?” It is a question I pose to my students throughout my time with them, in various ways. We watch how it evolves, as it should, as they grow and learn. It is a question that requires a relationship, first, with one’s self. Students must practice silence and be comfortable enough with them selves to ask the difficult questions. But it also has to do with one’s creative expression. Indeed, it is a question that can only be answered through the mythic, poetic voice. Through our art, we all define our selves. If we watch a music video today, we find what many women think of them selves, what many people of color think of them selves. These ideas come from a society that has marginalized them, has devalued them. The task of an educator then, is to find a way to identify our selves that does not rely on society’s skewed ideas. For any modern person, whether on the margins or very much in the mainstream, the tendency is to define oneself individualistically. Descartes’ ideas—cogito ergo sum (“I think therefore I am”)—form the basis for modern self-definition. This philosophy negates the body, the Earth, our cultural traditions, our communities, our ancestors, and our interpersonal relationships. 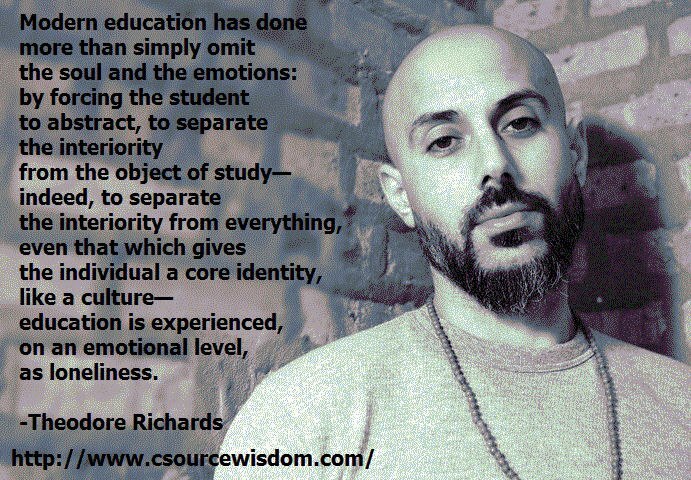 Modern education has done more than simply omit the soul and the emotions: by forcing the student to abstract, to separate the interiority from the object of study—indeed, to separate the interiority from everything, even that which gives the individual a core identity, like a culture—education is experienced, on an emotional level, as loneliness. When the Nobel Prize winning physicist Steven Weinberg says, “the more the universe seems comprehensible, the more it also seems pointless,” he is revealing a truth about modern epistemology more than about the nature of the cosmos. depth of my own uniqueness. of the struggles of my mothers. Please go to our contribute page to make a tax-deductible contribution. If you are interested in how to become a Wisdom Teacher, click here. This is the title of a recent U.S. Department of Education Program in which states with more innovative ways to improve outcomes (test scores) received extra money from the federal government. Pay less attention to the memories she brings. Are so good at forgetting. Of my mother’s body, nourishing me. Rendering us so easy to control.